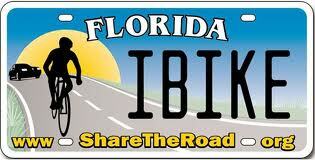 ​Your order is processed online and your new Florida specialty license plate is then issued and mailed to you directly from a Florida County Tax Collector's Office processed through the Florida Department of Revenue and the Florida Department of Highway Safety and Motor Vehicles. 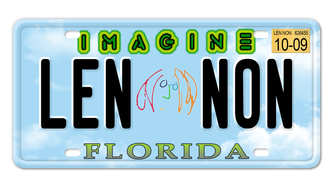 ​​​YOU CAN GET A FLORIDA SPECIALTY LICENSE PLATE FOR THE FIRST TIME; SWITCH YOUR EXISTING SPECIALTY LICENSE PLATE; SWITCH OUTSIDE OF YOUR REGISTRATION PERIOD OR CHOOSE TO INCLUDE YOUR ANNUAL REGISTRATION RENEWAL. ​YOU CAN ALSO PERSONALIZE YOUR SPECIALTY LICENSE PLATE (CHOOSE THE CHARACTERS YOU WANT ON IT). ALL ONLINE - STEP UP TO THE PLATE TODAY! 1. PAY -Make your secure payment, choose your license plate. ​2. SUBMIT REGISTRATION INFORMATION - After your payment clears, you receive an email to process your registration information securely. ​3. 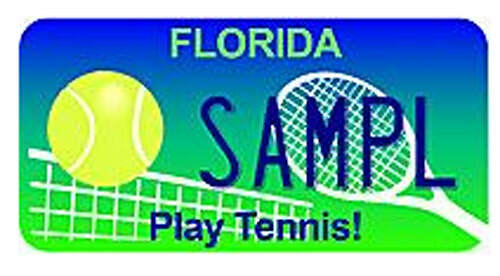 DISPLAY YOUR NEW PLATE - Receive your tag directly from a Florida Tax Collector by USPS and put your new tag and decal on your car and dispose of your old one. If you just need to renew your existing tag, please visit the DHSMV website: gorenew.com (additional convenience fees apply) or visit your local County Tax Collector or DMV office. 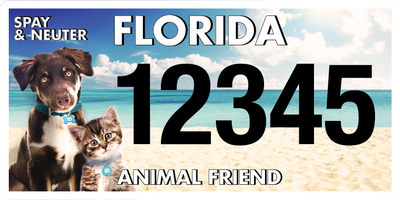 Your order is processed online and your license plate is then issued and mailed to you by a Florida County Tax Collector's Office through the Florida Department of Revenue and the Florida Department of Highway Safety and Motor Vehicles. BIENNIAL REGISTRATIONS: Note if you are currently in the first year of a biennial registration (2 year) period, the state charges extra fees for the second year of the registration period for specialty plates and for personalized fees. You will receive additional payment instructions if applicable. It all started with the Florida state legislature creating the Challenger specialty license plate, which 'launched' in January, 1987. Since then, Florida's specialty license plate program has raised nearly $700 million for worthy causes and on average over 1.4 million Florida vehicles annually participate in the program. 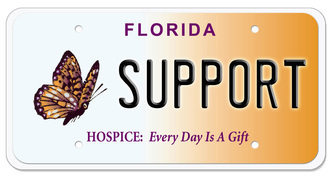 Florida Specialty license plates support a wealth of causes. Many are unique to Florida and famous artists and icons provide unique opportunities for Florida vehicle owners to accessorize their prize possessions, for less than the price of a decent car detail. In 2018, $33,509,016.00 was raised for the organizations represented by the 123 specialty plates, with 5 specialty plates raising more than $1 million, and the state collected an additional $20 million in state fees, administration fees and 'taxes'. 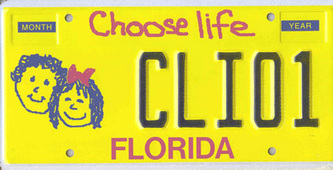 MyFloridaSpecialtyPlate.com and its predecessor EZTagFL has been providing the only online convenience for buying all of the available Specialty License Plates for nearly 10 years. Additional fees are charged to cover the costs of processing, delivery and convenience. ​All transactions are processed directly online and processed through a licensed Florida Tax Collector. THIS IS A PRIVATELY OWNED WEBSITE THAT IS NOT OWNED, AUTHORIZED, OPERATED OR AFFILIATED WITH ANY FLORIDA GOVERNMENT AGENCY. ALL SPECIALTY PLATE ORDERS ARE FULFILLED BY OFFICIAL COUNTY TAX COLLECTORS AND ALL TAGS AND REGISTRATIONS ARE MAILED DIRECTLY FROM THEM. ANY DELIVERY TIME ESTIMATIONS ARE SUBJECT TO STATE PRODUCTION TIMELINES, AVAILABILITY AND POLICIES AND ARE GOVERNED BY THE FLORIDA DEPARTMENT OF HIGHWAY SAFETY AND MOTOR VEHICLES. ADDITIONAL FEES ARE INCLUDED TO COVER THE COSTS OF CONVENIENCE, PROCESSING AND DELIVERY. Please allow a minimum of 30 days to receive your new specialty tag, and 90 days if you choose to personalize your plate, from the date you receive an email confirmation of your confirmed order.